Gas Masks are designed to keep you safe from airborne chemicals (chemical attacks) or tear gas in the case of civil unrest. Every member of your family or household should have a gas mask. Gas masks will be essential during natural disasters, civil unrest or when you need to bug out. During these times you may find yourself leading your family through areas will with smoke and fires. The materials burning may give off toxic fumes from burning and having lung problems or inhaling poisoning fumes will not help your chances of survival. Some of the most popular gas masks are the Israeli Civilian Gas Mask w/ Nato Filter. The assumption is that the Israelis are a tough people who live in a region where every county around them wants to destroy them. They have gotten really good at staying alive. Positive Pressure and Negative Pressure Testing procedures. You should test your Gas Mask as soon as you receive it and then retest it again, twice annually, for a good seal and proper fit. 1. Put the gas mask on and adjust straps until mask fits securely. Do NOT open the filter canister or attach the filter canister to the mask. 2. Use your hand to cover the gas mask’s intake area. This is the circular area where the filter attaches to the mask. 4. No Air should be able to enter the mask. You should feel reduced air pressure within the mask. The mask should feel like it is being sucked towards your face. 1. Put the mask on and adjust straps until mask fits securely. Do NOT open the filter canister or attach the filter canister to the mask. 2. Use your hand to cover the gas mask’s exhaust area located directly beneath the filter attachment area. 4. Air should not be able to exit the mask. You should feel an increase in air pressure within the mask. The mask should feel like it is being pushed away from your face to release the air pressure inside the mask. If your gas mask fails either of the pressure tests, return it for an exchange immediately. Many times the exhaust vent will be missing the rubber seal (disc-shaped rubber flap) that is supposed to prevent air from coming in via the exhaust. Q) Which is more important, speed or the airtight seal? A) Both are absolutely necessary. You must become expert, both in putting on the mask and getting an airtight seal in a matter of seconds. Strapping on a gas mask isn’t as easy as it looks in the movies. People have died by putting them on incorrectly or by not being able to put it on at all in situations of stress and panic. There are even accounts of people suffocating because they neglected to remove the plastic seal on a new filter before attaching it to the Gas Mask. There is a reason the military conducts gas-mask training exercises. Properly fitting and using a gas mask requires practice. Hands-on training by a professional is preferred. Prior practice at home is an absolute minimum. 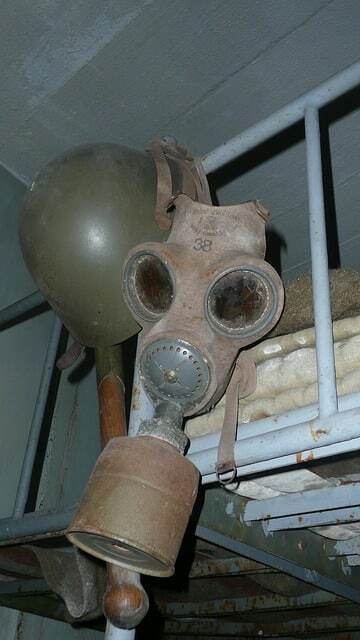 Gas masks may help protect your lungs, however, some chemical agents may be absorbed through the skin or eyes. Gas masks may reduce, but do not eliminate exposure to chemical or biological agents. Gas masks do not eliminate the risk of infection. Negative pressure masks can be dangerous for children or people with respiratory problems. There are reports of accidental suffocation when people have worn masks incorrectly, as happened to some Israeli civilians during the Persian Gulf War. Remove the plastic seal (or plug) on a new filter before attaching it to the Gas Mask! There is one on all of them!!! Gas masks for each member of your family, group or crew should be part of your emergency kit. They will greatly improve your chances of survival in a post disaster or post SHTF scenario. Geekprepper.com is a participant in the Amazon Services LLC Associates Program, an affiliate advertising program designed to provide a means for sites to earn advertising fees by advertising and linking to Amazon.com. © 2018 Geek Prepper - All Rights Reserved.